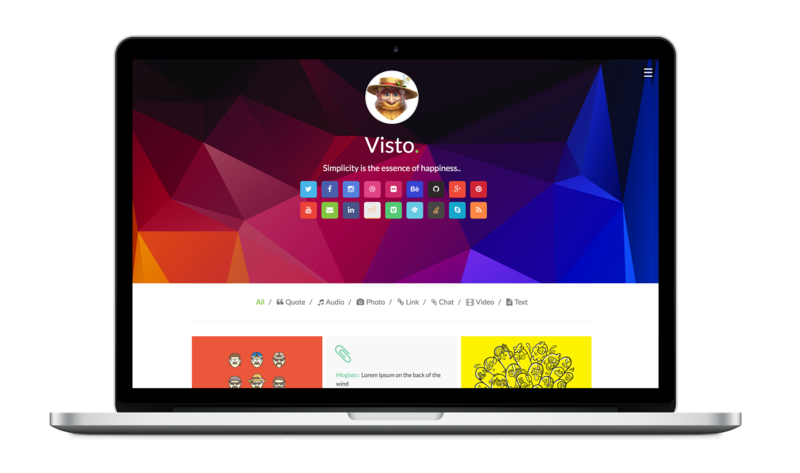 Visto is Clean multi-column & responsive tumblr theme for blogging. With Infinite Scrolling and animation ideal to display your pictures, works and medias. It features a customizable sidebar and all post types. Header Background option to use parallax scrolling effect. Offers support for all Tumblr post types: text, photo/photosets, quote, link, chat, audio, video, answer. You can add social links in theme’s footer (Like Button / Reblog Button / Time Stamp/Notes Count/Tags/Share). fully support, social media button with on/off option (facebook, twitter, instagram, flickr, dribbble, behance, github, googleplus ,pinterest). Includes support for Disqus comments system. Copyright © Made with Heart by TMint Creative. All Rights Reserved.